Brownotter Tatanka Hunts offers an exclusive opportunity for the Experience of a Lifetime! 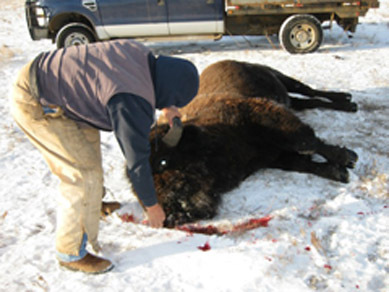 You will have a chance to hunt Indian owned wild North American bison herd on the Standing Rock Sioux Indian Rerservation in Bullhead, South Dakota. Trophy bulls range from 7 to 20 years old. Imagine yourself standing on a vista overlooking the Grand River. Off in the distance you view a pod of wild buffalo, and then another. Make it a reality and make it "The Experience Of A Lifetime" hunting Indian owned wild American Buffalo on the Standing Rock Sioux Indian Reservation on 32 square miles of private land. Share the unforgettable memories and the extraordinary meat with a partner as you walk where Sitting Bull walked and camped. You have permission to enjoy hunting on 20,000 acres of wild plains for prairie dogs, coyotes, bobcat and sharptail grouse as seasons dictate and tribal licenses may be required. Ron Brownotter is ready to share his world as your guide. Enjoy Indian lore, take a private tour of the reservation and see spectacular views overlooking the Grand River. Take advantage of this very limited opportunity to step back in time for an amazing cultural adventure and abundant lifetime memories. Ron Brownotter has made his home on the same ranch as his ancestors. He is a walking encyclopedia of the area. Have a question, just ask. He is very candid and quick to laugh. Take advantage of his knowlege of his culture and the culture of the area. These huge, fearless critters can weigh as much as 3,000 pounds and stand as high as 7 1/2 feet at the hump. The Brownotter Ranch encompasses 32 square miles with a herd of 400 to 500 free ranging wild American bison. Having limited interaction with people, the herd survives on natural native prairie grass resulting in extremely flavorful meat. Everything is included fo you and a guest once you arrive at our home in Mobridge, SD for 3-5 days. We provide lodging, meals, all refreshments, transportation to the ranch during the hunt, and complete fresh to frozen custom processing. Hunts are guaranteed and scheduled November through May. 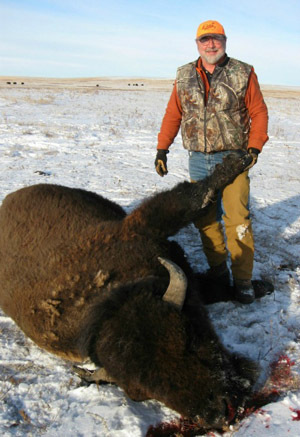 After your buffalo experience and your bison is being processed into fabulous steaks, roasts and burgers, you can opt for Prairie Dog, Predator or Sharptail hunting or fishing at Lake Oahe or the Grand River as seasons permit. Try your luck at the Grand River Casino & Resort with rooms available or you may choose to stay at the Wrangler Hotel in Mobridge, South Dakota, where you have a variety of options for your dining and shopping enjoyment. 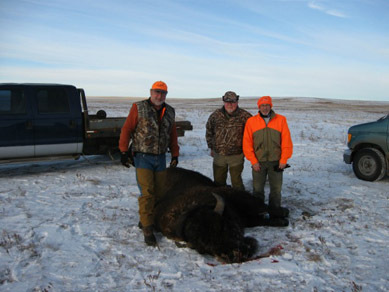 Make your reservation for your buffalo hunting experience of a lifetime! 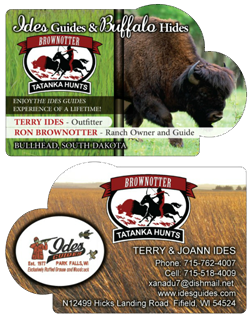 Ides Guides & Buffalo Hides with Brown Otter Tatanka Hunts bring an exclusive opportunity for you to hunt the only Indian owned, wild North American bison herd on the Standing Rock Sioux Indian Reservation in Bullhead, South Dakota. 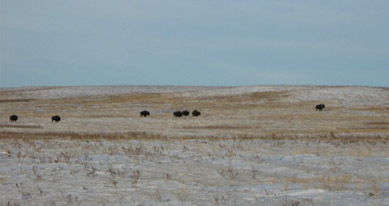 Hunting Wild Buffalo at the Brownotter Ranch on the Standing Rock Lakota Sioux Indian Reservation in Bullhead, South Dakota. Call to Reserve Your Buffalo Hunting Date!